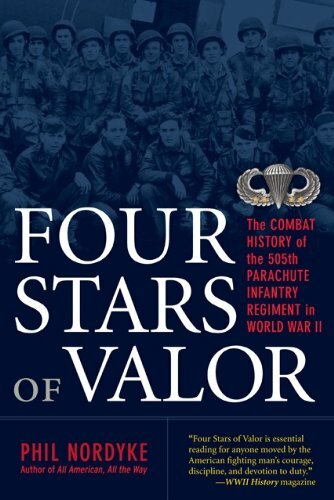 Four Stars of Valor: The Combat History of the 505th Parachute Infantry Regiment in World War II - Jimmie Aaron Kepler, Ed.D. Phil Nordyke’s “Four Stars of Valor: The Combat History of the 505th Parachute Infantry Regiment in World War II” is an excellent. It is must reading for any student of World War II. Mr. Nordyke does an great job as he takes us with the 505th Parachute Infantry Regiment (PIR) from its beginnings and training in the United States, through its deployment to North Africa, and through its campaigns in Sicily, Italy, Normandy, Holland, the Bulge, and Germany before returning home. The book takes it title from the 505 PIR’s record four combat jumps in Sicily, Salerno/Naples, Ste Mere Eglise/Normandy, and Nijmegen/Holland. Stars representing participation in combat jumps had been worn unofficially on parachute wings during and after World War II. FYI – this practice did not gain official sanction until after the 1983 invasion of Grenada, Operation Urgent Fury. Mr. Nordyke does an excellent job of using primary sources. At first I was a little confused when I encountered an incident that was described from multiple persons points of view, but quickly saw the value in seeing the way more than one person viewed/remembered an incident. It helped paint a more complete picture. Pages 300 – 301 and the actions of Private Camille E. Gagne’s response to the killing of First Lieutenant John Dodd is one example. The coverage giving to the 505th’s role in Nijmegen/Holland is very detailed and had me feeling I was were there. The 505th PIR’s involvement didn’t stop after it’s fourth jump into Nijmegen/Holland. They played a key role being deployed by truck into Belgium’s Ardennes Forest as the 82 Airborne Divisions helped stop Hitler’s in The Battle of the Bulge in freezing December 1944 and January 1945. The book has exceptional maps and an amazing index. This book should be required reading for active duty members wearing jump wings. It is a must addition to any military historian’s library and would be an excellent addition for all university and community libraries.